After a series of good appointments the last couple of weeks we got as close to definitive date for our little guy's scheduled debut as anyone is willing to give. Grab your party hats, because it looks like August 14 will be his birthday! Dr. Draper (one of my OBs) said he is impressed with the baby's growth and if his lungs check out as ready to roll during my amniocentesis on August 13, they will deliver him the next day. Despite all the special arrangements, new hospital and knowing exactly when he'll arrive, Dr. Draper is trying to keep things pretty normal for us. He said I could have my doula Carrie there and do a regular delivery because he anticipates our little guy will come very quickly due to my history of short (and then even shorter) labor. If I can pull off another natural birth it means I will be able to be taken over to Primary's to meet my son hours sooner than if I do the drug thing -- now that's true motivation! It's crazy to know that this whole dream-like scenario is about to coming crashing through the door to reality. There has been a surreal peace that has surrounded all the hoopla this pregnancy has brought on--I hope I can maintain that feeling of calm once our guy is here. I have to give a big thanks to everyone, especially my little sis and bride-to-be Aly, who has pulled through on the babysitting end of things for us. (Her help may even just earn her forgiveness for asking me to stand in the heat of an outdoor August wedding in a black dress/tent as her bridesmaid on the last weekend of my pregnancy :)) My boys think everyday is a party and have been sheltered (as I hoped they could be) from much of the stress of the situation because of your love and willingness to step in and make things as normal for them as possible. Many, many thanks to doting grandparents as well. We are so fortunate to have great moms and dads who go out of their way to make sure we're alright. We could not imagine trying to do this alone. Matt and I spent last weekend in San Francisco for one last getaway. Matt had a conference and I tagged along. Between the wharf, Chinatown, the vineyards and downtown shopping adventures it was so nice to walk together, laugh together, and truly enjoy each other's company--just the two of us. Although I was certain I was in love before the trip, it is now confirmed. Matt is still the guy for me and will be forever. It's awesome to know those feelings that started 15 years ago are still there and stronger than ever. 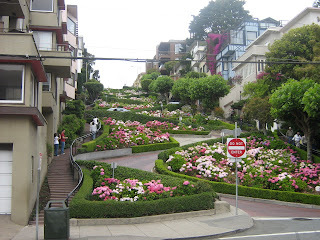 Here are pics of a beautiful vineyard in Sonoma and the amazing flowers of Lombard Street. 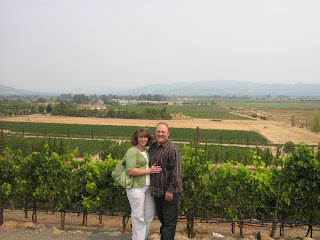 Mindi, I am glad you guys had a great time in San Fran. Your photos are gorgeous. And YAY! on the date for this little guy to make his appearance. We are really excited for you and know that this baby is extremely blessed to be coming to your family. Our thoughts and prayers are with you. I've always admired your upbeat spirit. We'll be thinking of you. Mindi, My best wishes,prayers and faith are coming your way as I type. I love you and your family so much. Good luck Mindi. I will be thinking about and praying for you. By the way, in the photo from San Fran you do not even look pregnant. You make me SICK. You are so wonderful! That is great that there is a date set for little man! Our thought and prayers are with you constantly. We sure love you guys. Hope to see you this weekend!